Rocketcat Games’ sequel app to Hook Worlds is the new Hook Champ game for iPhone which reminds me of Indiana Jones and Capcom’s Bionic Cammando. Players take on the role of a Archaeologist in search of artifacts of from ancient civilizations. But as I quickly learned, getting your hands on the items is the easy part — getting away alive is the real challenge. 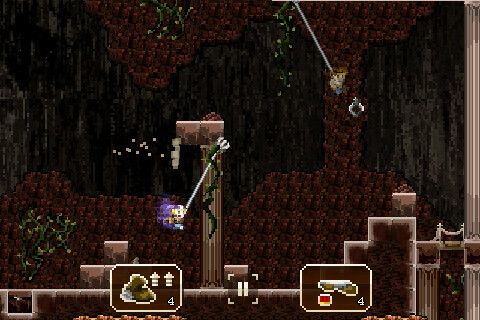 Immediately after attaining a treasure, players are perused by demons. Trying to outrun the thing will do you no good as it flies faster then you. 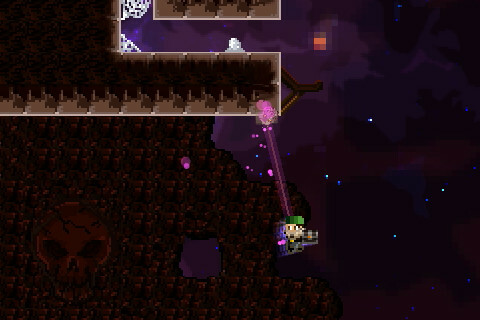 You have to instead swing through the mines and temples with your grappling hook. Each level contains different obstacles, like bats and water that slow your progress and lava that may kill you. Mastering the grapple hook is key. The controls are fairly easy to use. Tapping the bottom corners of the screen cause you to run in the given direction, while tapping the top corners launches the grapple hook. To release the rope, take your finger off the screen. Tapping the corner immediately after releasing causes the rope to launch again. Repeating this mechanic is the way to swing quickly — and that is the point of the game , to escape the perusing ghoul as fast as you can. Your time is posted to an online leaderboard. Upgrades to your tools and gear are available for purchase using coins collected throughout the levels. A recent upgrade to the application added the ability to play against a “ghost” of your previous play of a given level. You can, in this way, essentially play against your old scores. Like the last Rocketcat Games iPhone app, Hook Champ has pixelated graphics that recall to mind the 16-bit era of video games. Chiptune music only enhances the nostalgia, though sadly there isn’t any background music during actual game play. Music is only played while browsing menus. The only aspect I can find to complain about is the lack of a midway checkpoint. When you die, even if it is just before completing a level, you must start again from the beginning. This isn’t too big of an issue as levels are pretty short, but it would be a nice convenience. For only $0.99 Hook Champs is a great value. Counterintuitivly, I found the retro-style graphics to be a breath of fresh air. If you are playing on an iPad, iPhone 3G (or later model), or a third generation iPod Touch, loading times should be virtually non-existent. Older iOS devices may experience a bit of lag. Sample the free version of Hook Champ Lite on your iPhone. AppSafari review of Hook Champ was written by Joe Seifi on October 25th, 2011 and categorized under Action, Adventure, App Store, Games, Platformer. Page viewed 3763 times, 2 so far today. Need help on using these apps? Please read the Help Page.